First of all let me say …. Congratulations to the Duke and Duchess of Cambridge for the birth of their son. I am really pleased for you. But will the media please shut up. The airwaves have been dominated with the build up to this moment. Trying to guess its name, weight, booty size etc. etc. Each and every night the evening news has made a story out of telling us that there is no news on the birth. They have even made news stories out of telling us about the media coverage and how long some of the news crews have been waiting. This is boring. This isn’t news. Not everyone is that interested but still you, the media, ram it down our throats every chance you get. Now the great day has arrived. But you’re not done yet. Now you broadcast your “birth-day” specials, disrupt the airwaves telling us that the baby has been born, mum is doing fine, what the family must be feeling blah blah blah ….!! How long does that take ? Two, maybe three minutes. Nope, this momentous event requires the running of special shows, the disruption of long-planned programs. Every news program is dominated by guessing when we will get our first viewing of the newborn. Guessing what the names the child will be saddled with. Breakfast TV programs are even, so I am told, running book on the chosen names. Please, will you just shut up and leave the happy couple and their family in peace. More to the point leave us, the public, in peace. You have already spent more time theorising about this poor child than you have informing us about the really important issues that are blighting this world of ours. The viral message started its life in an April 2010 newsletter put out by the principal of Kaikohe’s Northland College, John Tapene, quoting a youth court judge’s tough advice for bored teenagers. 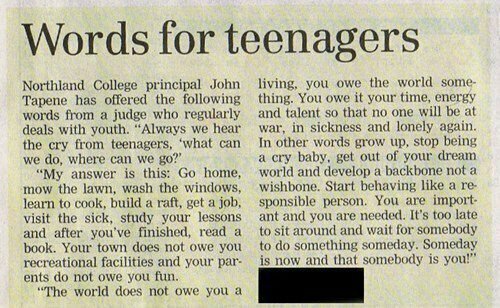 In short, the judge told teens to stop complaining they had nothing to do, urging them instead to take responsibility and “develop a backbone”. This cutting has been doing the rounds both via Facebook and email and although this article was originally published two years ago I believe the sentiments expressed have been relevent for many years and are still relevent to this day. Anyway, Mr Tapene’s words struck a chord with me and I felt I had to reproduce them here.